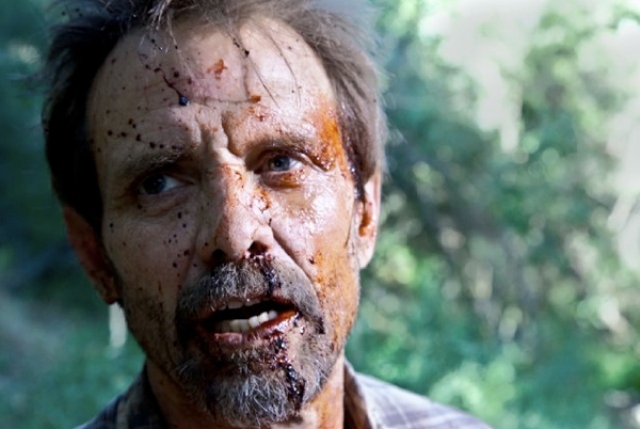 Michael Biehn’s directorial debut left me anything but THE VICTIM! Let me share with you one of the more surreal moments I had at the 2011 FRIGHT NIGHT FILM FEST. It was Friday evening and I was just leaving the dealer’s room when I found myself standing face to face with actor Michael Biehn. 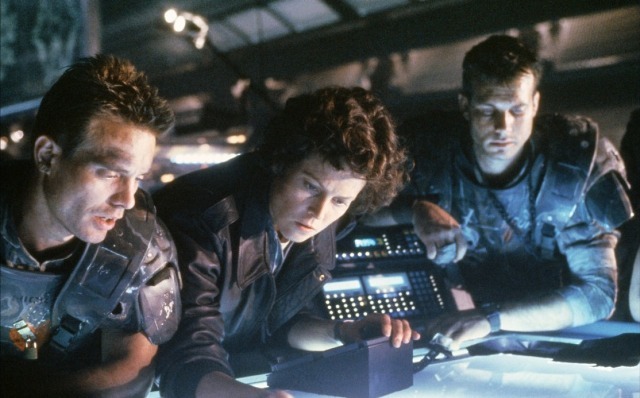 Biehn will forever be loved by genre fans, like myself, for his roles in such hallowed films as TERMINATOR, ALIENS, and PLANET TERROR! While my brain was trying to process the situation (it was pretty HOT on that Kentucky day and, quite possibly, an hallucination), Biehn further added to my sensory overload by placing his arm on my shoulder and saying, “You want to see a damn good movie? Step right in here!” I suddenly felt like a carnival patron being whisked into a sideshow attraction by one of its charismatic attendants. Some of the elaborate fan costumes & characters, ever present at FRIGHT NIGHT, would add even further to this perception. For better or worse, I soon found myself seated in front of a large screen slated to show Biehn’s new film, and directorial debut, THE VICTIM. Assisting Biehn in his efforts to drum up viewers, was an attractive blonde who looked very familiar to me. I studied her face for a few moments before finally remembering where I’d see her before. Back in the 1990’s, I remember watching a TV movie that featured her alongside BEVERLY HILLS 90210 alumnus, Shannon Doherty. Although it had been a while since I’d seen the film, I remembered it being a modern version of the 1950 Academy Award winning masterpiece – ALL ABOUT EVE (one of my all-time favorite non-horror films). Jennifer Blanc (the woman I now observed corralling horror fans into the screening hall) played a co-ed named Zanne who cozies up to Doherty’s character while, all the while, plotting to steal her boyfriend, turning her friends against her, as well as trying to snag her position as lead singer in their college band. There have been many incarnations of this plot line throughout the years (the worst being SHOWGIRLS) but this one (titled FRIENDS ‘TIL THE END – 1997) was highly entertaining and the fact that I remembered Blanc from that single viewing speaks volumes of her screen presence. Ms Blanc and Michael Biehn are now real-life husband and wife and have further enhanced their union by teaming up to make THE VICTIM. Although Biehn directs, while Blanc produces, they both have starring roles and are joined on screen by Rob Zombie HALLOWEEN hottie, Danielle Harris! Biehn took to the stage prior to show-time and informed us that what we were about to see is a film that took twelve days to shoot (not counting the months of fund raising and work needed to make those possible). While he wouldn’t divulge its exact budget, it was suggested that it was fairly low. Biehn stated, however, that this should in no way imply that it was lacking in punch. “It’s kinda like a big bowl of ice-cream,” explained Biehn. “You’re eating it all up and you say, ‘Ooh this is damn good’ but then, after you’re all done, you grab your stomach and say ‘Oh man, I shouldn’t have f*ckin’ ate that!” As the movie began, Biehn took his seat next to Blanc – both about 6 feet from me and within constant view. I have to confess that, at that moment, if I could have pressed a button and made myself disappear, I would have. Independent films can be a mixed blessing – especially the horror variety. I had a lot of ground to cover at FRIGHT NIGHT and, worse, without the assistance of the other Dave. My goals regarding this event were much less about film screenings and more about meeting the cast of DARK NIGHT OF THE SCARECROW for a magazine article I’m working on. Being stuck for an hour and half watching what I feared would be a horror film dud, was not even close to being on my agenda. While any other idiot with my dilemma would have just gotten up and left, it’s a good bet that they probably don’t “over-think” themselves to death like I do. I suddenly imagined myself getting up and casually heading to the EXIT; Michael Biehn and Jennifer Blanc feeling slighted – a lonely tear drop dripping down their cheeks like that old Indian in those famous 1970’s TV commercials about pollution. 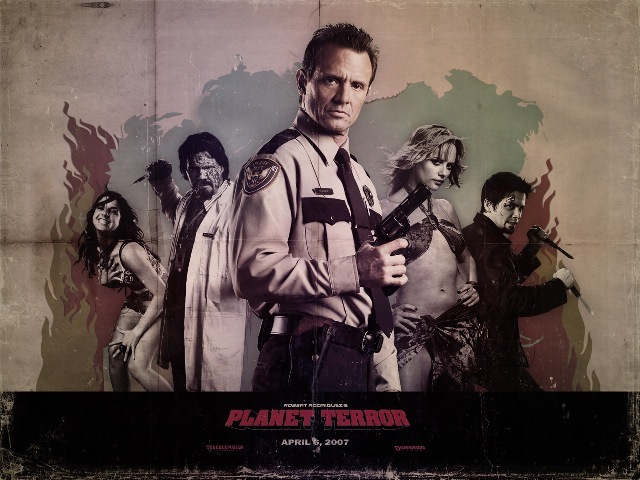 From there on out, every time I’d pop on ALIENS or PLANET TERROR (movies that are routinely played in my household) I’d have to think about the day when Biehn (who had brought me so much entertainment over the years via his films) personally asked me to watch one his own creations only to have me diss him in front of a room full of conventioneers. Like it or not, I was there to stay! I am happy to report that the movie ended up being VERY entertaining and time well spent! I really hope my fellow horror fans will keep a steady eye on its release as, despite its budget, it surpasses most recently released big studio horror films in terms of its entertainment value . The movie opens with party gals Annie and Mary (played by Jennifer Blanc and Danielle Harris) getting down and dirty with a couple of good ole boys in a forest preserve. Things suddenly take a lethal turn and Blanc soon finds herself running for dear life – eventually discovering a cabin owned by its reclusive occupant, Kyle (Michael Biehn). Similar to the Hitchcockian theme of an innocent man (that’s assuming Biehn’s character is innocent of course) finding himself caught up in extraordinary circumstances, Biehn must decide whether Blanc is to be trusted and, if so, whether he should threaten his efforts in getting his life back together by becoming involved with hers. After the film ended, Biehn and Blanc returned to the stage to answer a few questions. Apparently I had just been a member of the fourth audience to preview the film. They encouraged viewers to visit IMDB and give the film the highest rating possible which, after I returned home, did so without reservation. Biehn was right; watching THE VICTIM was indeed like enjoying a “big bowl of ice cream.” However, instead of a belly-ache, I found myself hungry for more! This entry was posted in Movie Reviews and tagged ALIENS, Danielle Harris, FRIGHT NIGHT FILM FEST, Jennifer Blanc, Michael Biehn, Sigourney Weaver, THE VICTIM. Bookmark the permalink.